Despite some initial problems with a groundhog and other animal eating food in the community garden, a small group of volunteers harvested and cleaned the garden weekend of September 8-9th. Two large baskets of vegetables (tomatoes, carrots, beets, green bell peppers, eggplants, yellow beans, onions, kale, chard and sage) were donated on sept 10 to Parkdale Food Centre. Below are some photos of what was harvested. Tomatoes, chard, kale, greens, and cabbage remain in the garden for a later fall harvest. Special thanks to Brian Enright, Richard Q, ICBY and all the volunteers who have helped with the community garden. Posted on September 12, 2018 by Mechanicsville Community Association. On July 25, 2018, the first of three Public Consultations for the Laroche Park Renewal Project was held at the Innovation Centre, Bayview Yards. The presentation is available here. Posted on August 14, 2018 by Mechanicsville Community Association and tagged larchoe park. 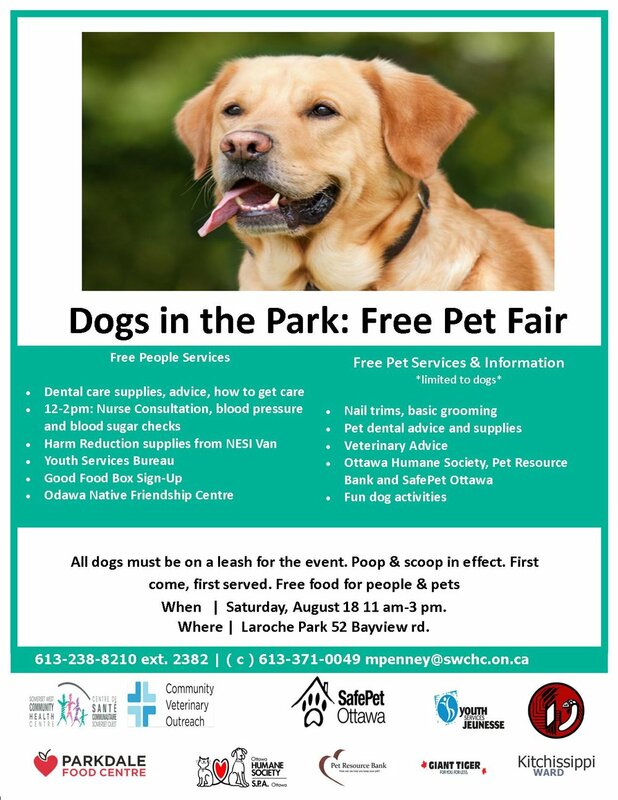 There will be a free pet fair on Saturday, August 18th from 11am-3pm at Laroche Park. Posted on August 9, 2018 by Mechanicsville Community Association. 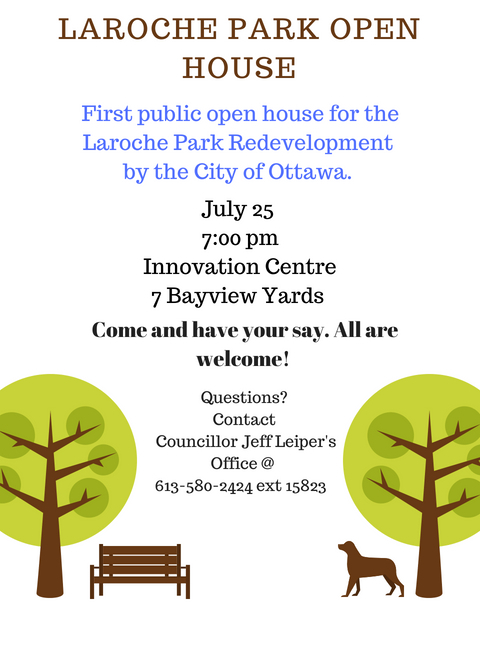 There will be a public Open House for the Laroche Park redevelopment on Wednesday, July 25th at 7:00-8:30pm at the Innovation Centre (7 Bayview Yard). More details are available are here. Posted on July 18, 2018 by Mechanicsville Community Association. Mechanicsville AGM occurred on May 8th, 2018. The AGM had Councilor Jeff Leiper, members of John Howard Society and Sommerset West in attendance. Louse Cerveny (Project Manger for Ctiy of Ottawa) did a preseentation on the rehabilitation of Larcohe Park and the replacement of the Fieldhouse. Posted on June 16, 2018 by Mechanicsville Community Association. Check out the Facebook page for our community garden, its called the Mechanicsville Innovation Garden ! Posted on August 27, 2017 by Mechanicsville Community Association. The Mechanicsville Winter Carnival in Laroche Park on Sunday saw over 100 people in attendance which was amazing for the first day of Winterlude on the Rideau Canal! People desended on Laroche Park from all directions with skates and toboggans. Pieces of cardboard also worked well on the toboggon hill, the skate rink had several games on the go and the skate puddle is just fun for those new to walking on ice.The fun-loving people with Somerset West Community Health Center led the kids activities such as snow tug-of-war and the snow jewel game. Snow pants were necessary as these activities involved lots of falling down and rolling around in the fresh snow. Inside the Laroche Community Center, every chair was full with residents warming up with hot chocolate and enjoying donuts donated by Suzi-Q and coffee donated from Bridgehead. A huge thank you to these two businesses for their support of local homegrown events like this one. Lots of residents dropped in to bring cookies as well which was much appreciated. Any left over goodies are donated to the home work club and youth program operated by Somerset West Community Health Center at Laroche Community Center. However, the star of this event is always the horse and sleigh ride. It always takes your breath away when you see those huge, handsome horses come across the fields of Laroche Park. Both kids and adults run from the toboggan hill and skating rinks to meet the horses. The annual Mechanicsville Winter Carnival has been held at Laroche Park for over 30 years and Gary Scharfe of Hollybrook Farms has provided the horse and sleigh ride every year! Its an important tradition in Mechanicsville and we are glad Gary returns every year. Huge thanks to Keith Brown with the Laroche Park Sports Association who maintain the rink and sponsor the horse and sleigh ride.The Mechanicsville Community Association is the community group who continue to work to improve our neighborhood and always seeking volunteers and board members. If you want to get involved, please send us an email at MechanicsvilleCA@gmail.com or on Facebook at Mechanicsville Community Association or see our website: mechanicsville.ca. Posted on February 6, 2017 by Mechanicsville Community Association. Posted on January 31, 2017 by Mechanicsville Community Association. We’ve got a bit of a treat for our next ward forum! On January 11, we’re hosting it from 6-9 pm at the newly-opened Innovation Centre at 7 Bayview Road. I’ve had a chance to tour around, and it’s a gorgeous space. And, to top it off, as our guest we’ve got City Manager Steve Kanellakos to present and take some questions. Staff and I are really looking forward to this one. There’s a lot going on in Kitchissippi – be sure to attend this town hall format event to pose your questions, raise your concerns, and get up to speed on what’s happening in the ward. Posted on December 14, 2016 by Mechanicsville Community Association. Posted on November 25, 2016 by Mechanicsville Community Association. Posted on November 15, 2016 by Mechanicsville Community Association. Councillor Leiper’s office has notified MCA of an upcoming environmental drilling program at Laroche Park (52 Bayview Road). The City’s Environmental Remediation Unit has been working with the National Capital Commission (NCC) for a number of years to investigate/monitor a groundwater plume containing elevated concentrations of volatile organic compounds (VOCs) which appears to be migrating from the adjacent NCC property at 80 Bayview Road onto the east portion of the park site. The environmental consultant working on behalf of the NCC has proposed an additional investigation on the two properties to investigate critical data gaps as a first step in evaluating potential remedial options for the VOC plume. The NCC’s environmental consultant will be drilling monitoring wells at 6 locations across the east portion of the park as part of the proposed work program. Underground utility locates will be marked in the next two weeks, and the drilling program is scheduled to take place between November 7 and 25. Posted on October 28, 2016 by Mechanicsville Community Association. The contractor for the John Howard Society facility has secured the NCC property at Carruthers and Burnside for a construction staging area. There is a Sign Person on Burnside at the top of the hill slowing traffic to accommodate heavy equipment crossing. This was a request by the MCA Planning & Development Committee. Please message us with any concerns. Posted on October 21, 2016 by Mechanicsville Community Association. Below is the link for the winter trail fundraiser, just in case you are interested. Note that it is also a winter walking and snowshoeing trail, not just for skiers. Posted on September 28, 2016 by Mechanicsville Community Association. Gently used running shoes, rubber boots and winter foot wear for children and youth. Posted on September 22, 2016 by Mechanicsville Community Association. I have recently concurred with a noise exemption to work at night on the light rail site between Tunney’s Pasture and Merton Street inside the Transitway trench. The work would consist of concrete chipping that can’t be done during the day while other work crews are sharing the space. I have agreed to allow the work from September 21 until October 5. The work will shift as they get various portions of the trench done, moving at about 60-90 meters per night. The noise level has been described to me as around 70-80 db at the source. Given that the work will be inside the trench and at a reasonably significant distance from the adjacent houses, I’m comfortable that this won’t be a prolonged or overly disruptive period. I have put conditions on the exemption including that there will be no backup beepers, or light sources that affect the homes next to the trench. I apologize for the short notice. The request was only made to me last week. I have let the project team know that we need much more notice so that I can in future consult fully with residents. They are aware that if the noise level is wholly unacceptable, that this will jeopardize future exemptions. Thanks for your understanding and my apologies for the disruption. Posted on September 20, 2016 by Mechanicsville Community Association. Invitation from the Mechanicsville Community Association to the residents of Mechanicsville to attend the Laroche Mural Ribbon-Cutting and Cake Event, August 31, 2016 at 4:30pm. Councillor Jeff Leiper, Crime Prevention Ottawa and Mayor Watson will be in attendance to cut the ribbon on the Laroche Community Center mural and thank the youth from SWCHS and children from Children's Village who painted this mural! Posted on August 29, 2016 by Mechanicsville Community Association. News from your community association! Mechanicsville Fire Fundraiser on July 28th at the Carleton Tavern raised about $2650 for the families affected by the fire at 59 Carruthers. Thank you to the musicians, volunteers, the donations and raffle prizes! MCA is seeking a sponsor for the purchase of a new BBQ and propane tanks for community events if you have any leads, let us know! Posted on August 11, 2016 by Mechanicsville Community Association. The Ottawa Film Office is drawing attention to Ottawa as a place for filming through a lookbook marketing tool. This lookbook should give filmmakers a visual understanding of all the different types of locations Ottawa has to offer. There is currently a gap in photos of residential locations that are usable for this lookbook. Should the community association have any useful pictures on file for this purpose, we would appreciate including them in our collection of pictures. The photos would need to show off the particular aesthetic of the community and be of good quality. They should not focus on any one specific building but should depict the overall feel of the neighbourhood as well as the style of architecture. Posted on June 14, 2016 by Mechanicsville Community Association.